It is sometimes difficult to just pick up and keep going doing what needs to be done, but that is what is required of us. Life was never meant to be just a bowl of cherries and we all seem to understand that there are obstacles that come in everyone's life, but when it happens to you personally we just are not prepared. I found that the most difficult part of life is self discipline. If you want to loss weight, it takes self discipline. If you want to become a good tennis player it requires self discipline. If you want to play piano well, it takes self discipline. There you go, whatever it is you want in life, IT TAKES SELF DISCIPLINE. Now the trick is how to put that into our lives and get the results we are looking for and need. ADJUSTMENT: now are you getting there and if not what changes are you needing to make. Go make it a great day. Pick up your boots. 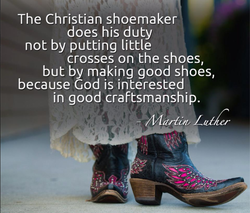 because God is interested in good craftsmanship.